In running through the Iowa results by county (map here, alphabetical list here), it's clear Obama outdid Hillary the most in the more densely populated urban areas like those around Des Moines, Cedar Rapids and Davenport. Comparing the counties where the vote numbers were in the thousands, like Johnson and Black Hawk, to Iowa as a whole using census results, there's some interesting numbers which could be bad news for Hillary in South Carolina -- an early voting state the media keeps saying will turn on the African American vote. Iowa is mostly white, 95%. But the counties with thousands of voters and in which Obama trounced Hillary have higher percentages of non-white voters and fewer older voters. Black Hawk County with 126,000 people is 8.1 percent African-American compared to the state wide African-American population of 2.1 %. It's white populaton is 89% compared to 94.6% state wide. 13.7% live below the poverty line (compared with 10.5% state wide). In yesterday's caucus vote, Black Hawk went 43% for Obama and only 28% for Hillary. Edwards came in third with 27%. I thought anything over .5% got rounded to the next number. Why aren't both Edwards and Hillary at 30%? Comparing the Iowa county vote maps (same link as above, scroll down) it looks to me like both Hillary and Edwards had deep pockets of support in geographic areas -- they each won a lot of counties -- while Obama's support,although he won more counties than the other two individually, was more scattered around the state and included the more largely populated areas around Des Moines, Cedar Rapids and Davenport. (Alphabetical county list with vote tally here.) The Republican map on the other hand shows Huckabee decimated Romney all over the state, with the exception of a pocket on the east and west side of the state. 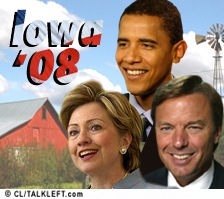 I don't think Obama ran away with Iowa. Hillary and Edwards did really well and if you put their numbers together, they surpass Obama's. Obama won, to be sure, but it's far from a mandate or a landslide like Huckabee got. And he did it without second choice voters like the Dems allowed. CNN pundits tonight skewered Hillary and sainted Obama. The pundits were so awful I had to use the mute button. Especially on Carl Bernstein. He couldn't even talk about Hillary...only about his very subjective perception that Bill Clinton seemed devastated. I saw the same speech -- live at the hotel -- and I thought Bill seemed proud. Obama is the hero of the night. The media loved his speech, in which he played (overplayed, in my view) the Martin Luther King, Jr. card. His other topic, repeated throughout, was his appeal to New Hanpshire voters. He does have one major asset in my view.... his wife Michelle. 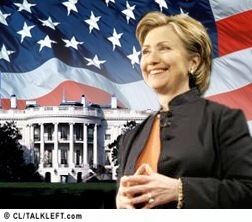 Hillary was gracious and like she always does, touted her experience and specifics about her aqenda if she's elected. But, her speech tonight was different -- in recognition of Obama's win of the youth vote, she stressed global warming and bringing the troops home. No mention of social security, caregivers, voting for a female, etc, which she was stressing just yesterday when I heard her in Cedar Rapids. 6:15 pm Iowa time: I'm at a Democratic caucus at the Roosevelt High School in Des Moines. There are several caucuses in the building. The one I'm at right now is taking place in the school auditorium. There are four seating sections, arranged like those in movie theaters, with rows of seats from right to left. Hillary supporters are in the front center section, Obama's section is to the right of her section and Edwards' supporters are to the left. Further back is a Richardson section. There's also a Biden section -- I'm not sure where his seats are but his staffers are on the far right. There's two chairs on the stage, and someone is putting a big Obama 08 on them. I'll add pictures later. Obama's section is fairly full. It's a very diverse group with lots of minorities. The Edwards supporters to my left are very sure of who they are voting for. Please let me know in the comments if there's something special you're curious about. Otherwise, I'll just live-blog. By the way, I'm doing this reporting-style -- which means neutrally. We're starting now, timed updates and after-thoughts below. 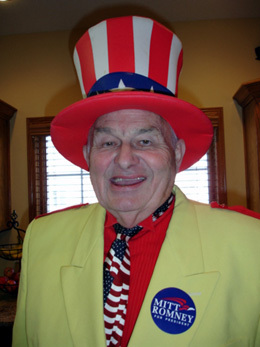 My name is John E. Gall, I am a registered Democrat, and vote at Precinct 1 in Hiawatha, Iowa. Tonight, January 3, 2008, I attended the Democratic caucus for that precinct in support of John Edwards. There were 180 registered voters in attendance. I did not see anyone from the media. Prior to tabulation of the votes for each candidate, no mention was made by the chair of any provision for resolving ties in assigning delegates; i.e., if candidate A earns exactly 3.5 delegates, and candidate B earns exactly 2.5 delegates, which candidate gets the half delegate rounded up or down? The following is what I remember of the evening's events. As Tom Petty says, the waiting is the hardest part. Doors open in two hours to the caucuses. Will independent voters turn out in droves to vote for a Democrat? Will the youth vote materialize? Will there really be an unprecedented number of first-time caucus goers? Will Hillary use all of her 5,000 drivers to get her supporters to their caucus venues? Who will the second tier candidates throw their support to? Jane of Firedoglake and I have three caucuses on our list and will live-blog from whichever we end up at. After the caucuses, we'll be at the Convention Center to watch the results come in real-time with the other 2,500 journalists. Both of us will have desk space with electrical outlets and internet connections. While we're waiting for the caucuses to start in a few hours, here's some short video clips I took yesterday of Hillary Clinton in Cedar Rapids. The first is about her successful bill to get medical insurance for the National Guard. This next one is about caregivers and medical insurance. John Mellencamp singing "Our Country" at the John Edwards event in Des Moines last night. And here's Elizabeth Edwards introducing her beaming husband. Update: Here's Mellencamp singing "Pink Houses." Update: Also check out Jane's post on the Edwards event last night and Huckabee event the night before. Most of you probably aren't old enough to remember the movie Wild in the Streets, about a politician running for Congress on the platform "Never Trust Anyone Over 30." The Hillary and Obama events today in Cedar Rapids and Coralville made me think of the film, because the caucuses are shaping up to be a battle between the middle-aged and geriatric vs. the young. And then, there's Edwards, whose support of the working person and the poor encompasses all age groups. One last night for the candidates to make their case. Hillary will be on Letterman tonight. She taped it in Cedar Rapids. She then went to her Des Moines campaign office to give a pep talk to staffers. John Edwards made 11 stops today and is finishing with a big event in Des Moines with John Mellencamp -- that's where Jane and I will be. The media has taken over this town. Sean Hannity's crew is at the bar/restaurant next door to our hotel -- he'll be broadcasting H&C from there. The Fox News people are staying at our hotel, as are the Clintons. Shep Smith got in last night. He told me Greta is here too, but I haven't seen her yet. Makes sense though. Update: Hillary's event was packed with hundreds of Iowans -- there were a lot of middle aged and elderly people. They were very enthusiastic and cheered a lot, particularly on health care. It started almost an hour late, which meant we were late getting to Obama's event at the Marriott in Coralville. We got there just as the doors opened and people started leaving. There were a lot of people -- they were predominantly young and younger. There were a lot of junior and high school age kids who obviously were too young to vote. We waited and watched everyone come out. Towards the end there were a few middle aged people, but just a few. It was also a very white crowd. We only saw a handful of minorities. Conclusion: If the college kids come out for Obama, he's in good shape. If the elderly come out for Clinton, she's in good shape. It's all about the turnout at this point. I'll have some video later I hope. My last computer battery is dying and we have an hour or more drive back to Des Moines. More when I can get near a power outlet. I just rode up the elevator at my hotel with Dorothy Rodham, Hillary Clinton's mother. I didn't recognize her. It was around 10:30 pm. I was waiting for the elevator to go up to my room with my laptop in one hand and a glass of brandy in the other. She walked up with a young woman holding her arm -- they were bundled up and had just come in from outside. 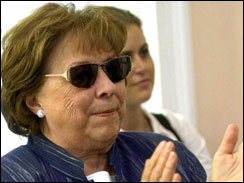 Dorothy Rodham: (Laughs, then says): You look so familiar. Are you on MTV? Me: (Very perplexed, partly because I wish I looked young enough to be on MTV but more because I can't imagine this elderly woman watches MTV): I'm Jeralyn Merritt. I'm a legal analyst but not on MTV. Mrs. Rodham: That must be why I know you. You look so Irish. Me: Oh...only I'm not Irish. Mrs. Rodham: Well, those eyes, they're so green. You look so Irish. Here's a tidbit of trivia for you: Secret Service regulations say the President can't stay higher than the level to which the fire department's tallest hook and ladder reaches. At our hotel it reaches to the 10th floor. So the presidential suite is lower than the top floor of the hotel. Hillary's staffers are doing a karaoke tonight at a sports bar connected to a bowling alley. I'm told it's the best bowling alley in town. The press is invited. Most of the Democratic candidates are out of Des Moines doing their final rounds but will back here by Thursday and the parties are all in Des Moines Thursday night. Today's afternoon delight was a Mitt Romney house party at the home of Ann Warren and family. It was in a suburban neighborhood where the houses are all white or beige and look almost identical. Jane and I were among the first to arrive, well before any other media. Ann welcomed us in and didn't seem to mind we were bloggers. After chatting with Oscar Poale, above, a former minister who now owns a Georgia Bar-B-Q place and shows up at a lot of Romney events, I began talking to Rich, who lives a few doors down from the Warrens. Obama was the choice of 32 percent of likely Democratic caucusgoers, up from 28 percent in the Register's last poll in late November, while Clinton, a New York senator, held steady at 25 percent and Edwards, a former North Carolina senator, was virtually unchanged at 24 percent. Remember, the DMR Poll nailed the order of the 2004 Iowa Caucus and is easily the most respected Iowa poll. Obama will now be the odds on favorite to win the Iowa Caucuses. (Speaking for me only) If the DMR poll is accurate, I predict that not only will Obama win Iowa, he will win the nomination.